And see the loved scenes of our Green Island Home. See her temples, her towers, and castles that stand. When Erin in freedom and chivalry shone. Excerpt from a broadside for MAC EVOY'S Pictoral, Musical & National Entertainment. This is a complimentary ticket to Charles MacEvoy's Original Hibernicon, 1870, from the collection of Sue Truman. 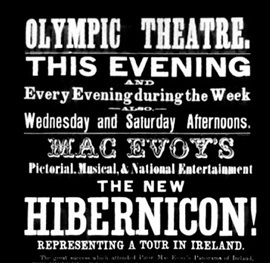 The Hibernicon shows began with the John Mac Evoy family in the early 1860s. His Mirror of Ireland show had the standard set up: the moving panorama with accompanying narration and piano music. A few years later he added Irish instrumentation (e.g. Uilleann piping, fiddle and harp), Irish stepdancing, comedy skits and song to provide more of an Irish variety show. This new formula proved to be a great success. Before long, there were others producing similar shows, some even using the Mac Evoy name. John's son Charles started his own Hibernicon company in the 1870s. 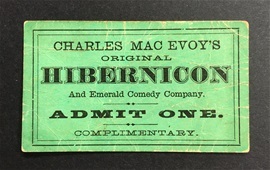 He inserted "Original" into the company name, Charles Mac Evoy's Original Hibernicon, to set them apart from others (see admission ticket). 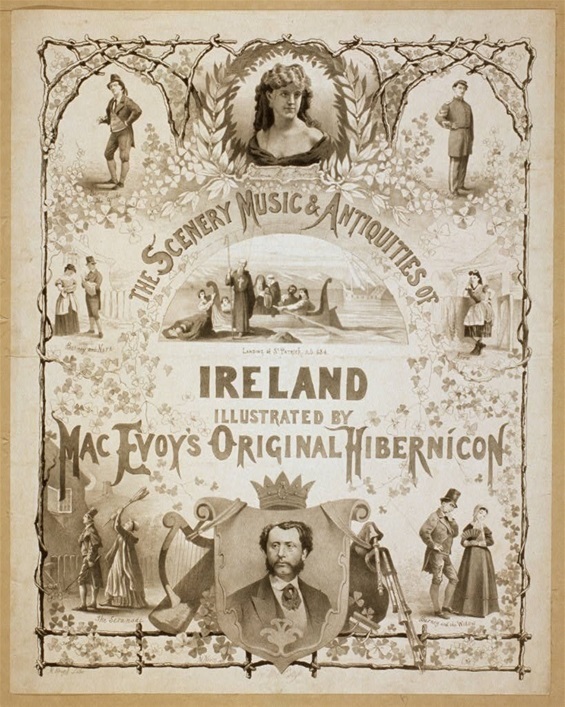 Charleston, SC Hibernian Hall March 21-26?, 1870 "MacEvoy's Great Pictorial, Musical, and National Entertainment, "The Hibernicon! "Representing a Tour in Ireland... "The Great Jerry Cohan as Barney the Guide. "Marie D. MacEvoy as Norah. "Miss Kate Halpine as Mrs. O'Callahan and the Wodow. "Charles MacEvoy, Musical Director and Lecturer. Image from the Library of Congress. HIBERNICONS originated in America in the New York City area. They were performed from Civil War times up to World War I and were most popular during the 1870s. The following description comes from an unknown writer who reminisces about seeing the Hibernicon shows. The panorama itself used to be set up on the stage a short distance from the back drop (that is, near the back wall of the stage). The panoramas consisted of a series of paintings about five by eight feet. They were attached to two upright spools and the operator usually was a boy who sat out of sight beside one spool and wound it up as the other spool unwound. There was a curtain in front with an opening just large enough to make a frame for the picture. Barney is wooing Nora. Little does he know, Nora's mother has excellent hearing. 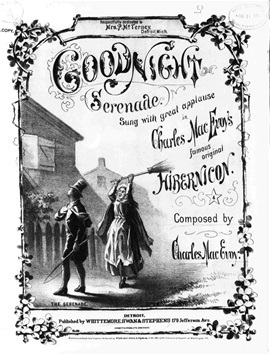 Sheet music by Charles Mac Evoy, 1871. From the Library of Congress. The Hibernicon shows did have a story line of sorts. A group of tourists leave New York Harbor on a steamship, headed for Ireland. The group visits popular attractions such as St. Patrick's Cathedral and Blarney Castle as well as Ireland's beautiful lakes, waterfalls and countryside. Then they board the steamer and return to America. Along the way, the tour guide Barney meets Nora and falls in love. This creates opportunities for song and for comedy. Will Nora give Barney the boot? Will Nora's mother give Barney a hit over the head? The Scenery and Antiquities of Ireland, published in 1842, contained engravings on steel of iconic places in Ireland along with descriptions, historical information and poems. Sue Truman collection. Unfortunately, none of the Hibernicon moving panorama paintings survived. We can get a glimpse of what they might have looked like from programs, newspaper ads, sheet music, souvenirs, broadsides, songsters and travel books! 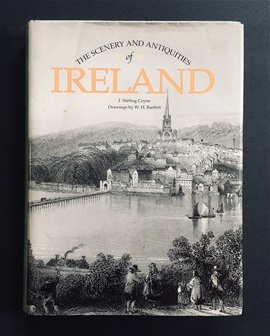 Michelle Granshaw writes that at least one company, McGill & Strong's Mirror of Ireland, used engravings from the travel book The Scenery and Antiquities of Ireland by J. Sitrling Coyne and W. H. Bartlett as source material for their painting. The illustration in the souvenir postcard below was taken from an engraving from the book. Other artists claimed to paint from sketches made at the scene. 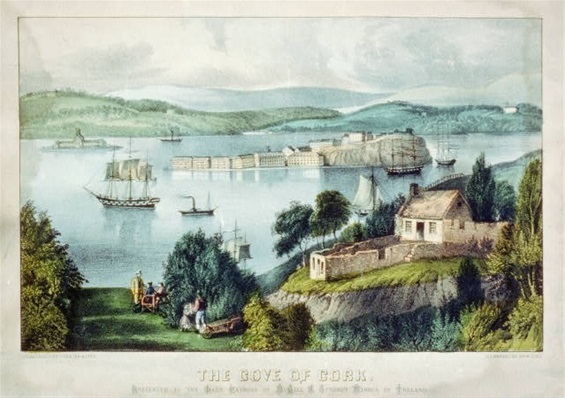 The Cove of Cork. This gorgeous souvenir card was presented to the lady patrons of McGill & Strong's Mirror of Ireland. Currier & Ives, hand-colored lithograph, Library of Congress. 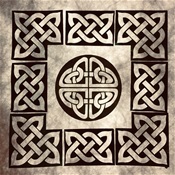 This image was adapted from the "Cove of Cork" engraving in the travel book The Scenery and Antiquities of Ireland. Michelle Granshaw writes about this in her brilliant 2012 dissertation. This travel poster was painted by French painter Hugo d'Alesi (1849-1906). Coincidentally, he went on to paint the epic Mareorama moving panorama which was shown at the 1900 Paris Exposition. This beautiful travel poster was painted by French painter, Hugo d'Alesi who was known as the "Father of the Travel Poster." 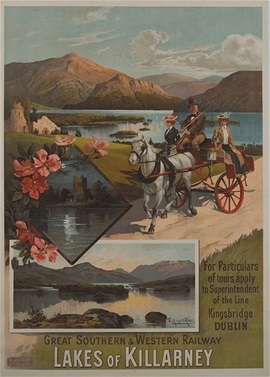 It shows a couple out for a drive in a Jaunting car by the Lakes of Killarney, a popular scene in Hibernicon moving panoramas. Could travel posters also have been an inspiration for moving panorama artists? This is a section of the program from McGill's Mirror of Ireland, 1870s. 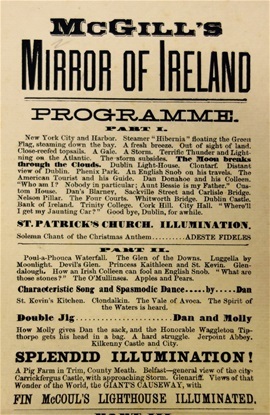 Hibernicon programs, like this one from McGill's Mirror of Ireland, gives us detail of the moving panorama scenes, songs, stepdancing and lighting effects. New York City and Harbor. Steamer "Hibernia" floating the Green Flag, steaming down the bay. A Gale. A Storm. Terrific Thunder and Lightning on the Atlantic. The very popular "storm at sea" scene. It was a great crowd pleaser with lighting effects. In addition, sound effects were commonly used such as a hand-cranked wind machine, thunder sheet or rain box. The storm subsides. The Moon breaks through the Clouds. Moonlight scenes were also popular. The moon shape in the scroll may have been made of a lighter colored material or more transparent material which could be illuminated from behind by means of a candle or limelight. 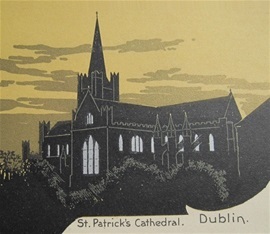 The St. Patrick's Cathedral scene may have looked like this when illuminated. This scene might have shown the church as more of a dark silhouette image. The windows would be white or a lighter color so when lit from behind, it would look like light shining through stain glass windows. The word ILLUMINATION is mentioned three times in CAPS in Part 1 and 2 of the program. My guess is in the St. Patrick's Cathedral and the Finn McCoul's Lighthouse scene, this refers to lighting effects to the scroll, illuminating the cathedral windows or making the lighthouse lense light up. In the section towards the bottom where it lists SPLENDID ILLUMINATION of a Pig Farm in Trim, the city of Belfast and The Giant's Causeway, this might refer to magic lantern slides. A double jig is a particular kind of tune with accompanying steps. This looks like a step dance duet. 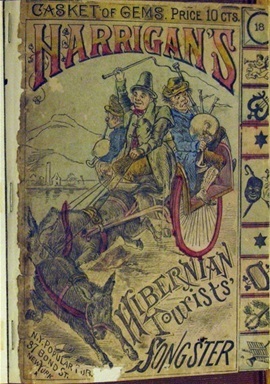 Harrigan's Hiberian Tourist's Songster, published 1885, 32 pages. A picture of the jaunting car on the cover. Harrigan's Double Hiberian Co. was popular in the 1880s. They held elaborate parades to advertise their shows. This proved to be successful as written in about the Watertown (NY) Times newspaper, April 1, 1886. The last sentence above is telling, the popularity of the shows was waning by the 1880s, but Harrigan's was still drawing a crowd. The use of the parades helped but they also had some of the most talented dancers and musicians of the day as mentioned below. Patrick (Patsy) and Mary Touhey who was a stepdancer. Harrigan's had the young Patsy Touhey (1865-1923) playing in the company during the 1885/86 season. He was to become one of the greatest Uilleann pipers of that time and is still an inspiration today. This was his first theatrical performing experience. He went on to perform in plays and musicals such as The Ivy Leaf. At the Chicago World's Fair he performed in one of the "Irish Villages." 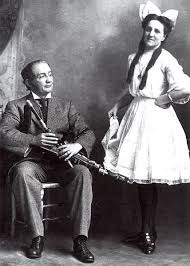 For more information about Patsy Touhey's playing with Harrigan's Hiberian Co., visit the website of piper and pipe-maker Nick Whitmer Patsy Touhey's Earliest Known Tour. Ogdensburg, NY, Advance & Democratic, October 28th, 1886. 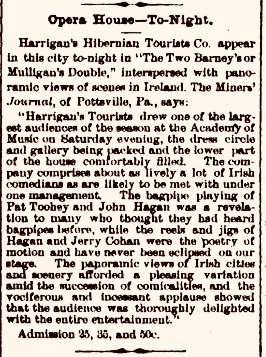 Not only did Harrigan's Hiberian Co. have Patsy Touhey playing the pipes, they also had Jerry Cohan (father of George M. Cohan "Give My Regards to Broadway" fame) as the Barney "tour guide". Cohan was a master showman and stepdancer and performed with shows in the 1860s and 70s including Mac Evoy's. To see and hear Patsy Touhey playing for the stepdancing of Jerry Cohan must have been electric. The bagpipe playing of Pat Toohey and John Hagan was a revelation to many who have thought they have heard the bagpipes before, while the reels and jigs of Jerry Cohan were the poetry of motion and have never been eclipsed on our stage. The Drowsy Maggie set, from the collection of Richard Twomey. Although we will not get to see one of the 19th century Hibernicon moving panoramas (unless one is rediscovered in an attic or museum) we can hear a bit of the music. There exists a few recordings of singers and musicians who played in the shows. 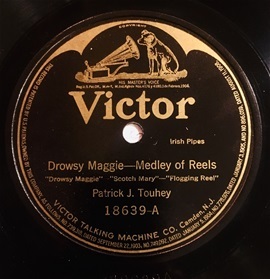 In 1919, towards the end of his life, Patsy Touhey recorded a three 78s. I have used one of those recordings in the crankie below. Enjoy! I created this crankie as a tribute to Hibernicons and piper Patsy Touhey who plays three reels on this 78: Drowsy Maggie, Scotch Mary and The Flogging. The crankie scroll contains machine cut and hand cut Tyvek images and torn tissue paper glued to a white Tyvek scroll. Thank you to Richard Twomey for use of the 78 recording and Michael Twomey for filming. Nov. 2017. There were many more Hibernicon Companies than those mentioned on this page. Nick Whitmer's website lists at least 40 different companies. Some toured up into Canada and over to Ireland, England, Australia and New Zealand. 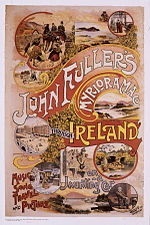 Popularity of the shows spread abroad resulting in companies originating in Ireland and Australia. A hand made thank you card to four Hibernicon friends! Special thanks to Michelle Granshaw, Nick Whitmer, Suzanne Wray and Erkki Huhtamo for sharing their research, images and encouragement.